Clash of the Titans is a 2010 American-Australian action adventure fantasy film and remake of the 1981 film of the same name produced by MGM (the rights to which had been acquired by Warner Bros. in 1996). The story is very loosely based on the Greek myth of Perseus. Directed by Louis Leterrier and starring Sam Worthington, Liam Neeson, and Ralph Fiennes, the film was originally set for standard release on March 26, 2010. However, it was later announced that the film would be converted to 3D and was released on April 2, 2010. Clash of the Titans grossed $493 million worldwide, though it received generally negative reviews from critics and received two Golden Raspberry Awards nominations. The film's success led to a sequel, Wrath of the Titans, released in March 2012. A third film titled Revenge of the Titans was in development but later cancelled due to Wrath of the Titans' disappointing box office performance. In ancient times, after defeating their predecessors, the Titans, the gods divided the world among themselves. Zeus took the skies, Poseidon took the seas, and Hades was left with the Underworld upon being tricked by Zeus. The gods created the mortals, whose faith and prayers has fueled the gods' immortality. As time passed, however, mortals began to question and soon resist their creators, angering the Olympians. The Olympians wanted to eliminate Man altogether, but Zeus had other plans for man. Zeus disguised himself as the King Acrisius and slept with the queen conceiving a child Perseus. So angry at Zeus, Acrisius murdered his wife and threw her and the child in the ocean. Zeus punishes Acrisius by striking him with lightning and turning him into the deformed creature Calibos. A fisherman named Spyros finds a coffin adrift in the sea, discovering a baby, Perseus, and the body of his mother, Danae. Spyros and his wife, Marmara, raise Perseus as their own son, alongside their daughter, Tekla. One day, an adult Perseus and his family watch soldiers from the city of Argos destroying the statue of Zeus. Infuriated at this, the Gods unleash the Furies who attack the soldiers. Hades then appears and destroys the family's fishing vessel, resulting in Perseus' family drowning. Only Perseus survives and is found by a group of soldiers. Perseus is brought before King Cepheus and Queen Cassiopeia, who are celebrating their campaign against the gods. Queen Cassiopeia compares her daughter Andromeda to the gods and boasts that she is more beautiful than Aphrodite. The revelry is cut short by the arrival of Hades, who has been given leave by Zeus to punish the mortals for their defiance. Hades threatens to unleash his monster, the Kraken, against Argos, unless Andromeda is offered as a sacrifice. Before leaving, he also reveals that Perseus is a demigod and the son of Zeus. Perseus meets Io, who confirms his origin. Perseus leads the King's Guard to the Stygian Witches, looking for a way to kill the Kraken. Seeking to help his newly discovered son, Zeus gives Perseus a sword forged on Mount Olympus and a winged horse named Pegasus. Perseus refuses the sword, but the captain of the King's guard, Draco, keeps the sword for when Perseus needs it. However, Perseus likes Pegasus. Soon after, they are attacked by Calibos, who kills several of the Kings Guard. Draco severs Calibos's hand and forces him to flee. The band gives chase but they are attacked by giant scorpions called Scorpiochs that spring from spilled drops of Calibos's blood. They are saved by a band of Djinn, non-human desert sorcerers led by Sheik Suleiman, who tame the remaining Scorpions. Also wishing for the gods' defeat, the Djinn lend their aid to Perseus and his band. As they continue to travel, Io aids and teaches Perseus and they begin to fall in love. The group arrives at the lair of the Stygian Witches and learn that to kill the Kraken, they must obtain and use the head of Medusa, a gorgon who resides in a temple in the Underworld. Any living creature that looks on Medusa's eyes will turn into stone. Perseus, Io, Solon, Draco, and their remaining men travel to the entrance into the Underworld. The men enter Medusa's temple lair while Io, being a woman and forbidden from entering, remains outside. Medusa kills most of the band, but Perseus finally manages to behead her by using his reflective shield to see her with his back turned. As he leaves the temple, Calibos appears behind Io and fatally stabs her. As Perseus and Calibos fight, Perseus accepts that he is a son of Zeus, picks up the Olympian sword, and stabs Calibos through the chest, which has restored him to his human form. With his last breath, Calibos urges Perseus not to become a god. As Io lies dying, she urges Perseus to leave her and save Andromeda and Argos. Perseus lovingly stays with her until her last breath instead of leaving immediately. Pegasus soon takes Perseus back to the city of Argos as the Kraken is released. The people of Argos seize and bind Andromeda to sacrifice her to the Kraken. Meanwhile, Hades reveals he does not require the faith or worship of mortals as Zeus does, as he has learned to survive on their fear. Hades then subdues the weakened Zeus. Perseus arrives at Argos and exposes Medusa's head to the Kraken, which makes eye contact just before it is able to reach Andromeda. The Kraken gradually petrifies and crumbles. Prokopion, the insane leader of the Cult of Hades, attempts to kill Perseus, but Cepheus stops him and is stabbed, before both are killed when the Kraken's petrified claw falls on them. Hades appears, intending to kill Perseus, but Perseus, invoking Zeus, throws his sword at Hades, forcing him back to the Underworld. Perseus rescues Andromeda, who will soon be crowned as Queen of Argos. She asks Perseus to stay by her side as the King, but he declines. Perseus also refuses another offer of godhood from Zeus, who then proclaims that if Perseus is to live as a human, he should not be alone, and subsequently revives Io, reuniting Perseus with his love. Sam Worthington took the role of Perseus because he wanted to make a Clash of the Titans for his nine-year-old nephew's generation. During filming the cast had a few laughs about the costumes, but he took it very seriously "so the audience doesn't have to." Worthington also did not wear sandals while filming; he instead painted toes on his sports shoes so he could perform the stunts better. Clash of the Titans was originally set for standard release on March 26, 2010. The Heat Vision Blog reported on January 27, 2010, that after a 3D conversion test of the film which Warner Bros. found to be a "roaring success", the film would be converted to 3D and would premiere on April 2, 2010. 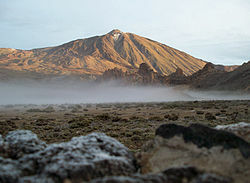 The national premiere in Spain took place on March 30 in Santa Cruz de Tenerife, the capital city of the Canary Islands. Clash of the Titans has received generally negative reviews from critics, who criticized the film for its use of 3D, flat characters, and divergences from the original film and the myth. Review aggregator website Rotten Tomatoes reports that 27% of critics have given the film a positive review, based on 244 reviews with an average rating of 4.3/10. The website's critical consensus states, "An obviously affectionate remake of the 1981 original, Louis Leterrier's Clash of the Titans doesn't offer enough visual thrills to offset the deficiencies of its script." On Metacritic, the film was assigned a weighted average score of 39 out of 100, based on 37 reviews from mainstream critics, indicating "generally unfavorable reviews". Even before release the film attracted some negative attention for its original tagline, "Titans Will Clash", although the trailers, edited to match "The Bird and the Worm" by The Used, were praised. In his review for the Chicago Sun-Times, Roger Ebert gave the film 3 stars out of 4, stating "I don't say it's good cinema, although I recognize the craftsmanship that went into it. I don't say it's good acting, when the men have so much facial hair they all look like Liam Neeson. I like the energy, the imagination, the silliness". Richard Corliss of Time could understand why the film received negative reviews, but found it "a full-throttle action-adventure, played unapologetically straight." He dismissed other critics' complaints, writing that the film is "very watchable in 2-D", that other critics were biased by nostalgia for the original, and that 15 seconds of Bubo is enough for his tastes. Colin Covert gave the film a mildly positive review, stating the film was "all flash, trash, and crash; a tasty hunk of baloney; mindless yet shamelessly thrilling." He considered Worthington to have a "Shatneresque heaviness about him", and found that all the laughs came from the fact that the heavyweight actors were "slumming through their roles". Owen Gleiberman of Entertainment Weekly gave the film a B-, writing "The new Clash isn't a cynical rehash. It has the flavor of a certain pre-CGI innocence." James Berardinelli gave it a mixed review, concluding that Clash of the Titans is a flawed but mildly entertaining regurgitation of Greek mythological elements, but it's also an example of how poorly executed 3D can hamstring a would-be spectacle. Peter Travers of Rolling Stone awarded the film 1 star out of four, stating "The film is a sham, with good actors going for the paycheck and using beards and heavy makeup to hide their shame." In a review for the Chicago Tribune, Turan complained that the film is worse in 3D; he went on further to explain that the action scenes are "more of a distraction than an enhancement", with the battle scenes being cluttered and "harder to follow rather than exciting". Claudia Puig for USA Today wrote that the film's "most outstanding achievement is the ability to be both chaotic and dull". Justification for her opinion came from the frantic action sequences and muddled special effects. Dan Kois blamed the director for making a "muddled disappointment" instead of a "camp classic that could have endured for generations". Kois also accused Leterrier of not knowing how to direct an action scene, and that the film is lacking in "wit and flair". David Stratton also criticized the film's action scenes, suggesting to Leterrier: "check out your local video store for something by Kurosawa, or almost any movie with sword fight scenes, to see how it's done." Namco Bandai Games.inc & Warner Bros. Interactive Entertainment released a video game adaptation of the movie on July 27, 2010, on PlayStation 3 and Xbox 360 with the film's home video release. It was originally planned to come out in March 2010, though the game was delayed due to difficulties. The game follows Perseus on his quest to fight Hades and his minions. Production of a sequel titled, Wrath of the Titans, directed by Jonathan Liebesman began on March 23, 2011, with Sam Worthington, Ralph Fiennes and Liam Neeson returning to star and released on March 30, 2012. In November 2011, Warner Bros. hired Dan Mazeau and David Leslie Johnson' who wrote Wrath of the Titans, to write and develop a sequel with Johnson announced a title called Revenge of the Titans but it was later cancelled. ^ a b c "Clash of the Titans (2010)". Box Office Mojo. IMDb. Retrieved September 25, 2010. ^ "Clash of the Titans Commences Production for Warner Bros. Pictures and Legendary Pictures". Business Wire. April 25, 2007. Retrieved December 31, 2009. ^ "News Etc". Empire. April 2008. pp. 15–16. ^ "Clash of the Titans Commences Production for Warner Bros. Pictures and Legendary Pictures". Business Wire. April 25, 2009. Retrieved December 31, 2009. ^ "Clash of the Titans (2010)". Rotten Tomatoes. Fandango Media. Retrieved March 16, 2018. ^ "Clash of the Titans Reviews". Metacritic. CBS Interactive. Retrieved March 16, 2018. ^ Heritage, Stuart (January 7, 2010). "Does Clash of the Titans have the worst ever film tagline?". The Guardian. Guardian News and Media. Retrieved March 16, 2018. ^ Ebert, Roger (March 31, 2010). "Clash of the Titans". RogerEbert.com. Ebert Digital LLC. Retrieved March 16, 2018. ^ Corliss, Richard (April 2, 2010). "Clash of the Titans: A Hit from a Myth". Time. Retrieved April 13, 2010. ^ Covert, Colin (April 2, 2010). "Review: "Clash of the Titans" is action-packed fun". Star Tribune. Retrieved March 16, 2018. ^ Berardinelli, James. "Clash of the Titans". Reelviews.net. Retrieved April 2, 2010. ^ Travers, Peter. "Clash of the Titans review". Rolling Stone. Retrieved March 17, 2012. ^ Turan, Kenneth (April 2, 2010). 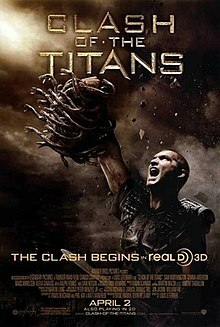 "Movie Review: "Clash of the Titans": 3D Makes the Film More Difficult to Follow in Places, and So It Crashes to Earth". Chicago Tribune. Retrieved April 13, 2010. ^ Puig, Claudia (April 2, 2010). "'Clash of the Titans'? The gods must be crazy". USA Today. Retrieved April 14, 2010. ^ Koi, Dan (April 2, 2010). "A hero's quest? No, a fool's errand". The 'Washington Post. Retrieved April 13, 2010. ^ Stratton, David (April 1, 2010). "'Clash of the Titans'". At the Movies. Retrieved June 23, 2010.